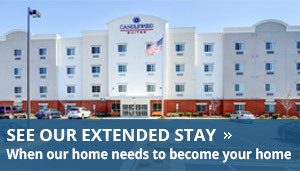 Discover all that the beautiful town of Wake Forest has to offer at the convenient, comfortable all new Extended Stay Candlewood Suites Wake Forest hotel. You are at the heart of everything, shopping, dining, entertainment and the arts. 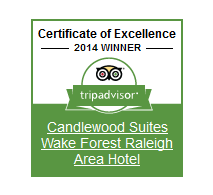 Only a short drive from the capital city, Raleigh, North Carolina and 25 miles from RDU Airport, our Candlewood Suites is an excellent choice for the Raleigh, Durham and Cary areas. You will spend less time in traffic and more time doing what you came to Wake Forest or North Raleigh to do. We are strategically located off of HWY US 1 and HWY 98 off Exit 125. Looking for hotel packages? Book one of the hotel packages available at this hotel for an enhanced stay. Be sure to enter your dates, number of guest and number of rooms to customize the list of available hotel packages.